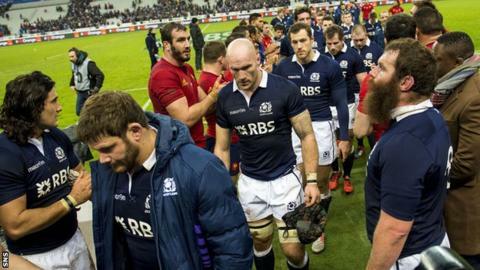 Scotland head coach Vern Cotter felt fortune favoured France in his side's 15-8 Six Nations defeat in Paris. A Dougie Fife try brought Scotland to 9-8 but Greig Laidlaw's conversion attempt came back off the upright. Earlier, one of Camille Lopez's five successful penalties went over via the post. "It was one of those days where they hit the post and the ball goes in and we hit the post and the ball goes out," Cotter said. "We were pretty close to taking something as we created a lot of opportunities. "We could have come away with a draw, the boys kept believing and that was really encouraging. "They played with big hearts and we stayed in the contest for the whole game. "I thought we defended well, our line-out and scrum stood up to what was a very physical game but our guys rolled their sleeves up and got stuck into it. "I'm glad we got ourselves into a position where we were competing all of the time." Cotter believes there is plenty of promise for the Scots to take into next week's meeting with Wales at Murrayfield. "It could have gone either way and on this occasion it went to a French team who I thought played well," he said. "But it's a good start for our guys, they are already talking about lifting the performance for next week. "It's obvious to me that the players are very frustrated and very disappointed. "That's a good emotion to have moving forward as we wanted to do better. "There's a determination within the group to improve. There were positive things in this game and we need to develop those and move forward." Captain Laidlaw lamented the fact Scotland "were on the wrong side of the penalty count" at Stade de France. "We were frustrated with that as it's a tough enough place to come to and win even when things are going well," added the Gloucester scrum-half. "The last thing we needed was the penalty count going against us but our performance on the whole was good. "We stood up defensively under pressure but the players have already spoken about it, we need to use this emotion and take it into the game against Wales next week. "We are playing at home at Murrayfield, we need the crowd behind us for a home performance and we just want to get back home and kick on in the Six Nations as this is just the start."